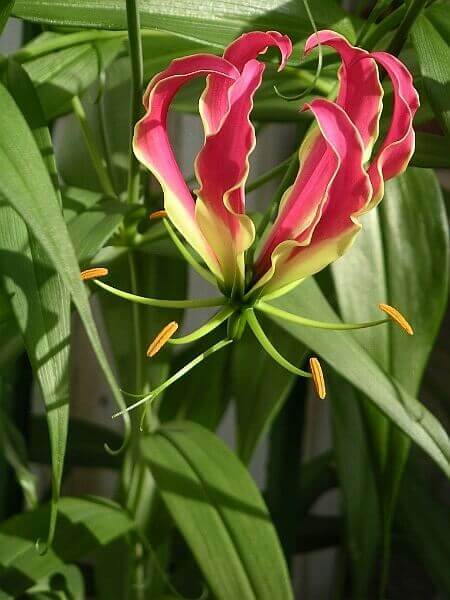 Gloriosa is a genus of five or six species in the plant family Colchicaceae, from tropical Africa and Asia. The most common English names are flame lily, fire lily, gloriosa lily, glory lily, superb lily, climbing lily, and creeping lily. They are tender, tuberous rooted deciduous perennials, adapted to summer rainfall with a dormant dry season. Their native range is Africa, Southeastern Asia and parts of Malaysia, but they are now widely cultivated. Gloriosa superba is the national flower of Zimbabwe (where it is a protected plant). It is also the state flower of Tamil Nadu state in India, and was the national flower of Tamil Eelam, and as such was displayed during Maaveerar Day. Gloriosa are perennial herbs that climb or scramble over other plants with the aid of tendrils at the ends of their leaves and can reach 3 meters in height. They have showy flowers, distinctive because of their pronouncedly reflexed petals, like a Turk's cap lily, ranging in colour from a greenish-yellow through yellow, orange, red and sometimes even a deep pinkish-red. Orange red with yellow at the base of flower's. Flower's age to dark pink. Excellent cut flower.